Students of Brandon University's Master of Psychiatric Nursing program were recently on campus for a three-day orientation session. BRANDON, Man. 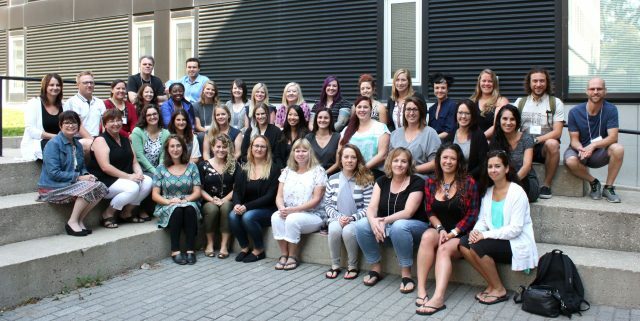 – Scattered across Canada for the bulk of their studies, Master of Psychiatric Nursing (MPN) students gathered at Brandon University (BU) recently for three important days of orientation. The students converged at BU for a series of seminars, research presentations and networking, forming key relationships before returning home to continue their coursework. Using online learning platforms and discussion forums, students normally take two or three years to complete their coursework, then spend another year on their theses. With many of them balancing full-time work in the mental health field with their studies and family life, the annual opportunity to meet face-to-face and share with students is an excellent opportunity to share ideas and encourage success. The only program of its kind in North America, BU’s Master of Psychiatric Nursing program has grown steadily since its launch in 2011. Currently 58 students are working toward their MPN, with five more students taking courses with the intent of applying to the program in the future.